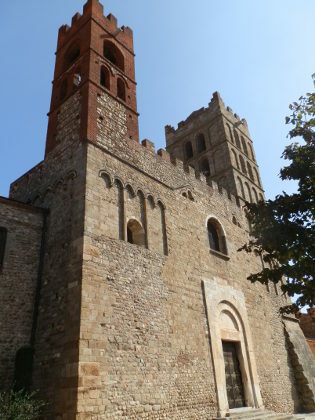 Elne is a small cathedral town on the French side of the Catalan border close to Argeles sur Mer that used to be the capital of Roussillon part of Catalonia until this changed to Perpignan in about 1276. It's an old town with Roman foundations, apparently a stop-off for Hannibal on his way to attack Rome. If you take the autoroute into France, there are the French tourist signs on the motorway advertising the cloisters at Elne as a place to visit. We didn't go in to see the cloisters, but we did visit the town on one of our periodic forays into France for shopping to pick up squash/cordials and other bits and bobs we struggle to find on the Spanish side of the border. From the autoroute we take the first turn off at Le Boulou - our normal first line option for shopping - and follow the road along the plain at the bottom of the Abreres range of the Pyrenees in the direction of Argeles sur Mer. Argeles is a seaside town built on the flat with campsites and low modern houses and apartment blocks in French pastel colours along the beach stretch. It's very popular for camping and main UK camp operators rent tents. In the middle of summer it's also phenomenally popular with the French - seeming to be busier than parts of the Costa Brava with lots of family-type attractions and souvenir outlets, but with a very strong French vibe. The beach is long, flat and wide and very different to the bays and calas of the Costa Brava, and perhaps a little unattractive. But the French really sell their region with plenty of vineyards and wines, calls to eat the local oysters and mussels and celebrating and connecting inland attractions with the coast much better than the more low-key Costa-Brava-style. But for this visit we're going to Elne rather than Argeles - just 2-3km away. The cathedral stands on a hill above the plain and can be seen from far away. We park at the outskirts of Elne by an Intermarche and walk into the centre past the Casa de la Vila. In this area elements of Catalan mix with the French in signs and names and some road names have both a French and Catalan version on the signpost. The current main town sits at the bottom of the hill and feels very French with houses with shutters and parades of taller houses (even down to the amount of dog-pooh in the middle of the pavement - a traditional French hazard). We've arrived at lunch-time - about 1.30 - but in contrast to Catalan villages that shut down in the afternoon, there are still people about in the town or taking a beer in the cafes, though the shops are closed. There is a formal tourist itinerary marked on the signposts, but to be pefectly honest, the town is small enough that it's as easy just to explore a little. The first place we go to is to walk up by the town walls - built with large pebble stones arranges in lines and in through what would have been one of the old town gates. We then continue up looping around to an open space at the back of the Cathedral at the top of the walls. 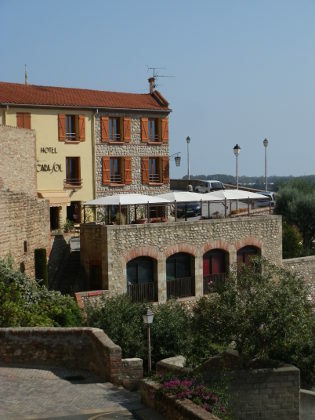 The views are excellent, though there is haze in the day we can see the sea in the distance and the new apartment blocks by the coast, or look north and the city scape of Perpignan, or walking further round we can see the Pyrenees and the watchtowers on the peaks of the Abreres to the south. The Cathedral is huge and there is access from the back into the cloister (which we didn't visit), but we walk around the wall top before ambling back through the old part of the town past what would have been the castle and on to the front of the Cathedral where a party of children are being told the history in Catalan (it's unusual to have school on a Saturday). The town has several gates and a network of smaller streets with painted houses with a strong French feel - it's always a little surprising how strong the cultural differences are one side of a border to the other, even though the distances are quite close. But given Elne is quite small we feel we've seen as much as we want. On the way back we stick to the N-road rather than take the motorway and drive through Le Perthus - an odd town that for parts of it has Spain on one side of the road and France on the other. We then call in on La Jonquera and visit one of the supermarkets. La Jonquera for the French is like Calais is to the English - a place to stock up on booze and cigarettes at the lower Spanish prices. The supermarket has masses of alcohol, but also sells other items in bulk. We've not been in before (since we're on the Spanish side), but because of the volumes, even for Spanish shoppers there are a few bargains.